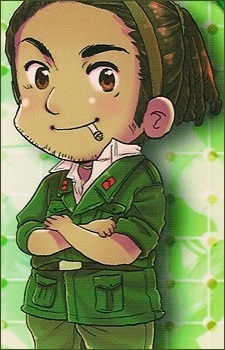 Cuba is a good-humored, heavyset man with strong emotions who speaks in a Kawachi dialect. He is often seen wearing bright colored Hawaiian looking shirts, shorts, and sandals with his dark hair tied back into dreadlocks. He loves ice-cream and smoking Cuban cigars, but hates America. He mistakes Canada for America often, and ends up beating him up. Despite this, the two are on good terms. In Ginmaku Hetalia Axis Powers: Paint it, White, Cuba and Canada were shown working together to help provide aid to the people affected by the Pict. Although his official human name has not been decided, Hidekaz Himaruya revealed in a blog post that he has considered "Carlos," "Ericemdo," "Jajuan," and "Máximo" as possible first names with the possible surname "Machado."